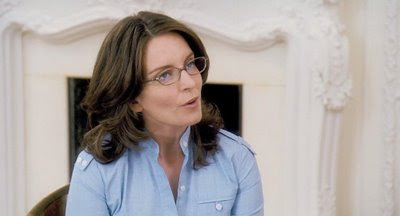 In a bold attempt to attract a younger, more beautiful and enthusiastic audience, John McCain shocked the world and tapped NBC sitcom star Tina Fey for the VP slot. Fey beat out challenges from both Sharon Osbourne and Valerie Bertinell i. "For two weeks, a team of four reporters-including Alan Smith, who broke the Donna Rice scandal-staked out Hunter's OB/GYN office until she was spotted and snapped outside a nearby grocery store on December 12. "The picture you see where she looks like Camilla Parker Bowles took fifteen days," reporter Alan Butterfield, who was at the scene, remembers. "We sat in our car." Before publishing the photograph on December 19, the Enquirer pressed Edwards to confirm the story, Perel says. Edwards's attorney offered to provide a sworn affidavit that his client hadn't fathered Hunter's child, but, according to two former Edwards staffers, Edwards never signed one. Perel says the paper also offered Edwards the chance to take a polygraph test; if he passed, Perel would kill the story. 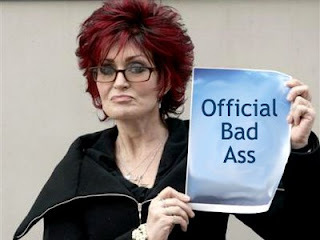 Edwards declined the offer." "Shortly after 2 a.m, Hitchen saw McGovern return to the lobby. Expecting Edwards to take the elevator to the basement where he could escape through a rear stairwell, the reporter positioned himself at the bottom of the stairs. Edwards popped out of the elevator and started up the stairs. Then Hitchen pounced. "Mr. Edwards, Alexander Hitchen, from the National Enquirer. Would you like to say why you were at the hotel this evening to see your mistress Rielle Hunter and your love child?" he asked. Edwards froze and "turned pale," Hitchen remembers. Edwards made a move for the top of the stairs but Butterfield, standing with a photographer, was blocking the exit. "He ducked, tucked, and ran," Butterfield says. The Enquirer reporters ran after him, Hitchen asking questions all the while. "Do you think for the sake of your child, you should admit paternity?" he said. If there's any comic relief in the war between Russia and Georgia, it's this statement from Randy Scheunemann, John McCain's top foreign policy adviser: "In the twenty-first century, nations don't invade other nations." Coming from America's No. 1 advocate for invading Iraq -- Scheunemann headed the neocon-inspired Committee for the Liberation of Iraq in 2002 -- that's rich. Or perhaps Scheunemann thinks the US invasion of Iraq happened in an earlier century. What's not funny, though, is Scheunemann's ties to Georgia. Where's the outrage? Why isn't there a congressional investigation of the McCain's adviser's entanglements? @U2.com is simply the best U2 website out there, including U2.com. I link to articles there every now and again and post in their forum pretty often. But now @U2 is making me a whore. That's right, I'm selling the soul of the watts4u2 blog to enter a contest to win 3 CDs I already have (well, I have the unremastered versions), plus a few songs that didn't make the cut originally, and one or two that were added to recently in some fashion. I hear the boxes and artwork are nice though, and since I have virtually everything they've ever released and then some, I sure would like to win those. Seriously though, I don't have them but I want them. I can't justify the expenditure to my wife or myself for that matter. But to win them? Mmmmm, I'm feeling giddy all over, that would be so exciting. "One passage in the president's statement is cause for alarm, however. He announced that he was directing Secretary of Defense Robert Gates to execute a "humanitarian mission to the people of Georgia, headed by the United States military." Bush stated that a C-17 transport plane loaded with humanitarian supplies was already on its way, and that in the days ahead U.S. military aircraft and naval forces would be tasked with delivering aid. That is a reckless move. The supposed cease-fire that was proclaimed on Tuesday seems largely ineffectual. Without a reliable truce in place, U.S. military forces would be entering a volatile war zone. 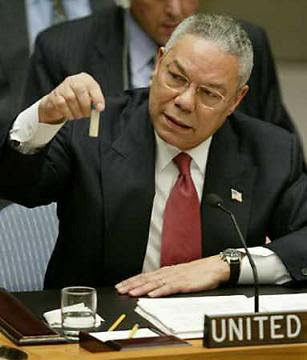 Moreover, there was no indication that Bush was asking the Russians for permission. Indeed, his statement had all the characteristics of a demand — or a dare. "We expect Russia to ensure that all lines of communication and transport, including seaports, airports, roads, and airspace remain open for the delivery of humanitarian assistance." The arrogance of that position is breathtaking. When a major cyclone created widespread devastation in Burma earlier this year, some proponents of humanitarian aid urged the U.S. military to compel delivery even in the teeth of opposition from the Burmese junta. American leaders rejected their pleas, however, deeming such an operation to be too dangerous. Apparently that situation was considered more dangerous than barging into a war zone where the military forces of a nuclear-armed power are conducting military operations. Washington is creating a situation in which one nervous or trigger-happy Russian soldier could ignite an extremely ugly and perilous confrontation." Let me put it this way.... if we decided the border with Mexico was a military problem, if we decided to enforce our border down there.... what the hell business is that for Russia? Would we allow them to use military transport to bring humanitarian aid to say, Tijuana? Let's go a step further.... let's say Russia also is building "missile defense" systems for El Salvador, Colombia and Venezuela. Maybe we have some folks in Washington who can look at both sides of an issue? If not, maybe we can elect some this year, whayddaya say? "Most of us who survived that experience are now in our late 60's and 70's. Sadly, we have died and are dying off at a greater rate than our non-POW contemporaries. We experienced injuries and malnutrition that are coming home to roost. So I believe John's age (73) and survival expectation are not good for being elected to serve as our President for 4 or more years. I can verify that John has an infamous reputation for being a hot head. He has a quick and explosive temper that many have experienced first hand. Folks, quite honestly that is not the finger I want next to that red button." Really interesting article from someone who has known McCain for almost 50 years. I told ya, back on 12/19/07, that the Enquirer was onto something. Now it's out there, he's admitted it. Who was Edwards to think he could run, when this story has been 'out there' since well before the primaries began? Dude. 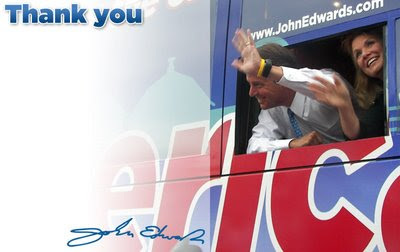 I've liked Edwards for the most part during his brief political career. A few of of my first blog posts were about Edwards back when he shone like a meteor, taking his Senate seat to the national stage, contending for two presidential nominations. Now he is gone. Toast. Worm meal. Lower than a crawdad's belly in a sink full of soaking hot seaweed. At least his wife was in remission at the time? At least it's not his baby, that we know of, yet? At least he didn't love her? I think he could have done better than that, I mean it's not like she's super hot, or a brewery heiress or something. Color me disappointed.